Hiya! 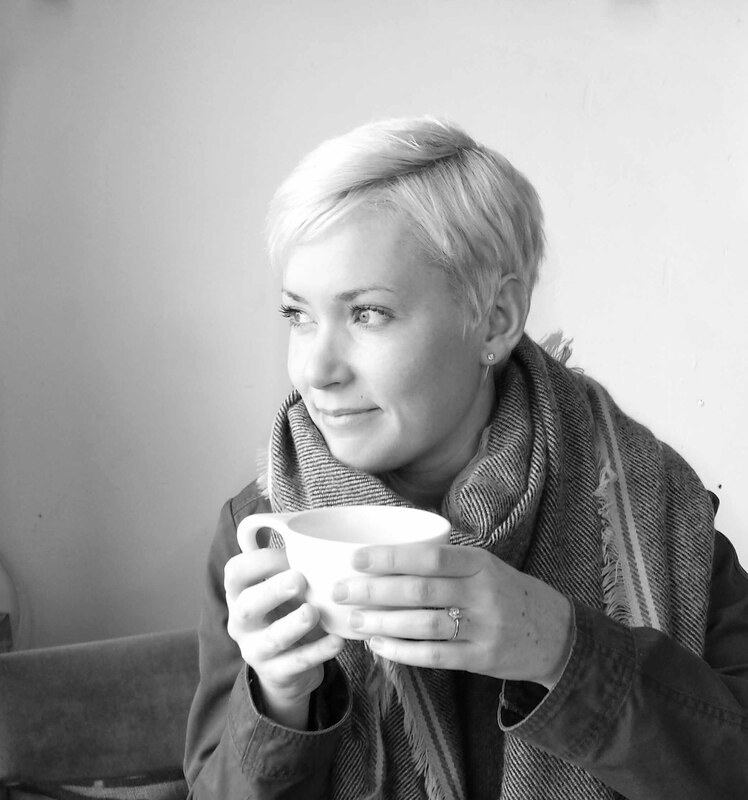 Today's post is a good one and a long one! I've been carving and building these cute little wooden handled stamps over the past few weeks. It started as a personal experiment in printmaking and carving, and quickly turned into a really cool craft that I had to share! 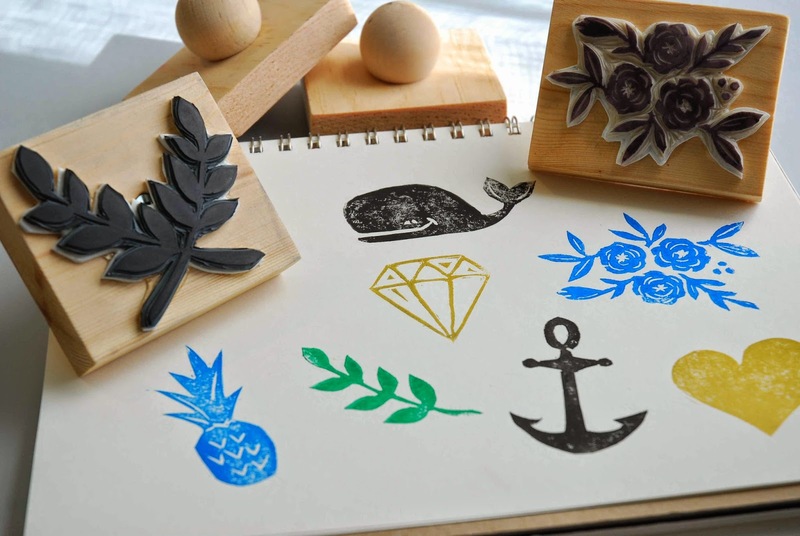 Making these stamps is not difficult, but there are a lot of steps. It took me awhile just to prepare this post because the project has so many components. 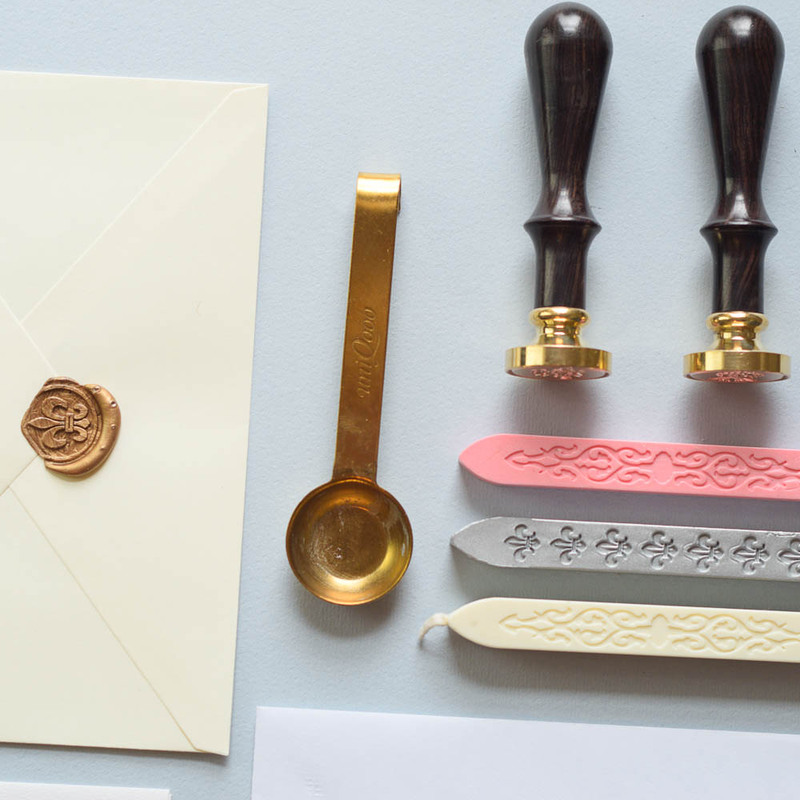 You begin by designing and carving the stamp. 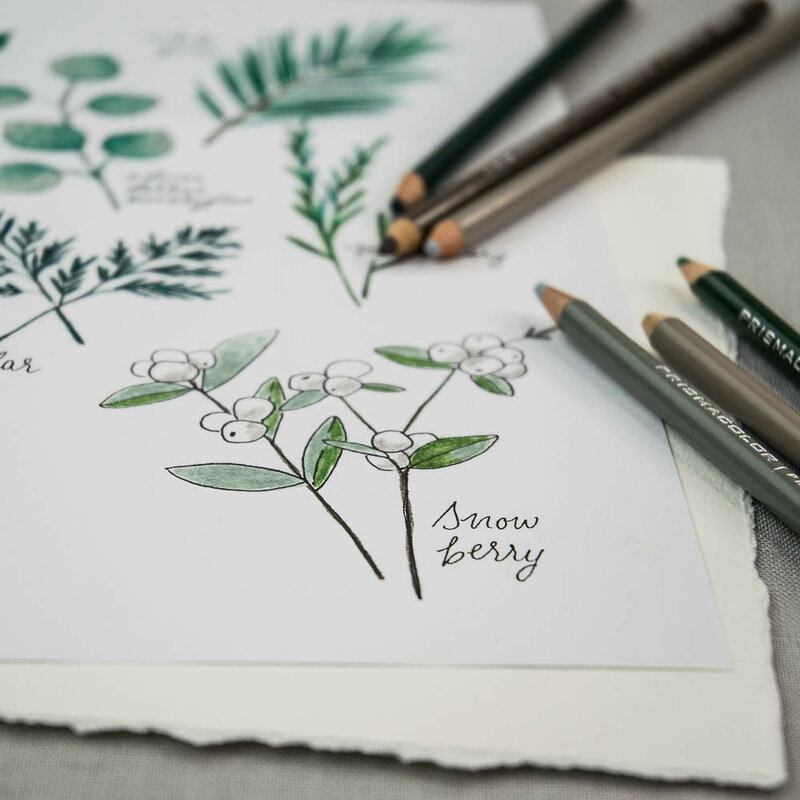 If you don't like to draw, no worries, simply print out your design and begin there. 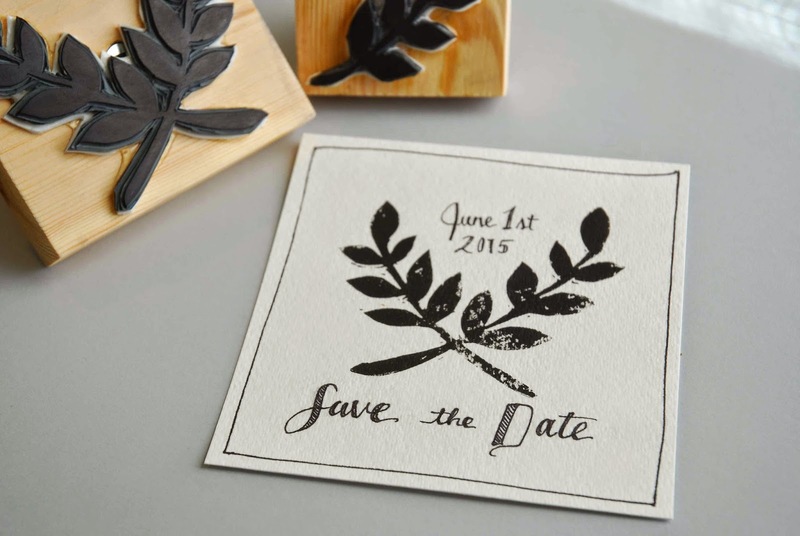 Once you have your design in hand, it's time to carve the stamp. 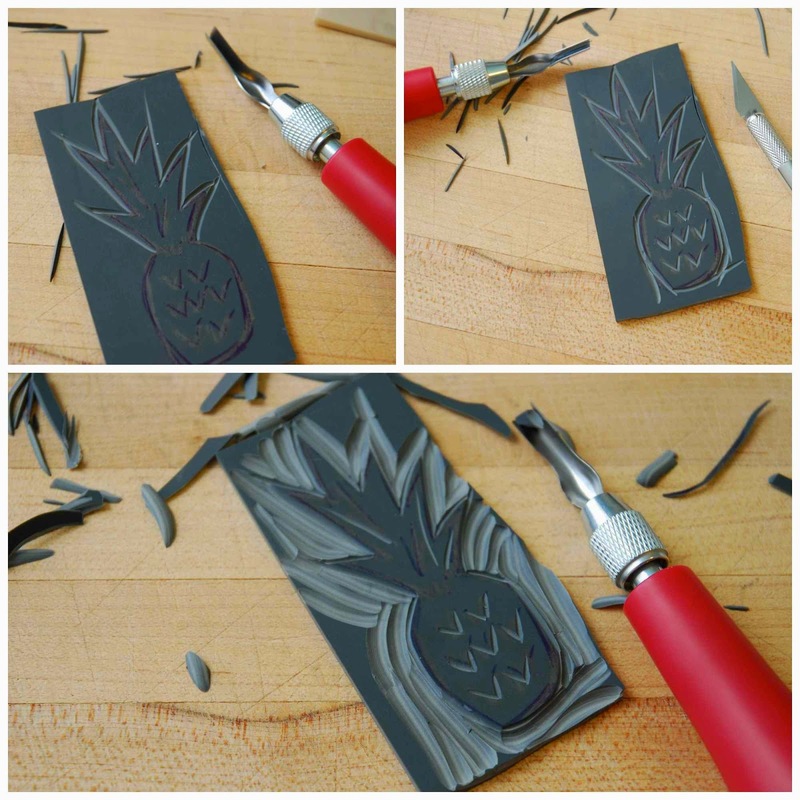 For this project you'll be using print making, specifically linocut printmaking supplies, which you can find at most art stores. The next step is a small woodworking craft, building the handle. With a few supplies from the hardware store this part is very easy. Once the stamp and handle are ready to go, I'll show you how to assemble them. And then it's on to printing! 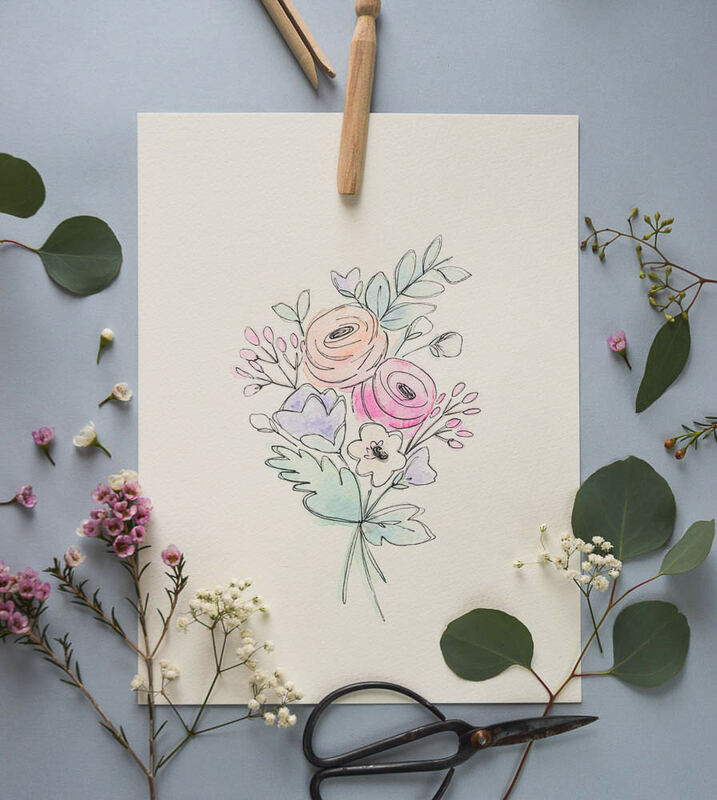 A few tips and tricks on inking will have you making amazing personalized stationary in no time! I've broken this project down into four parts. 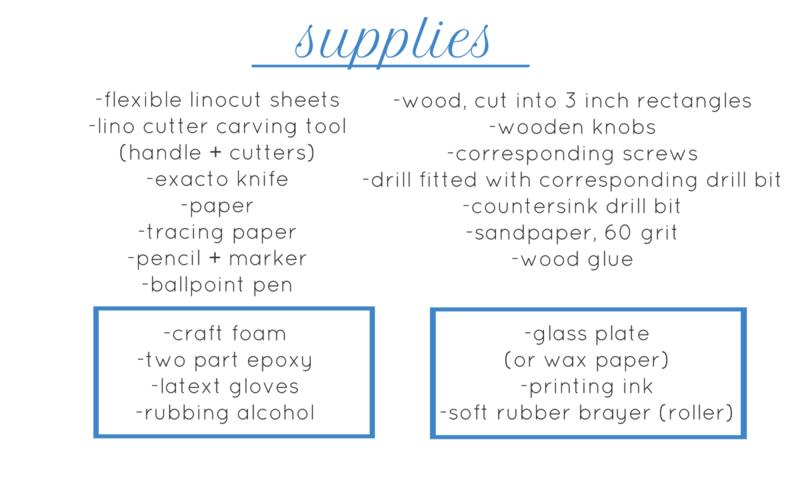 Let's get started with the list of supplies! Traditional linocut printmaking is done on a lino sheet that is mounted on a block of wood. 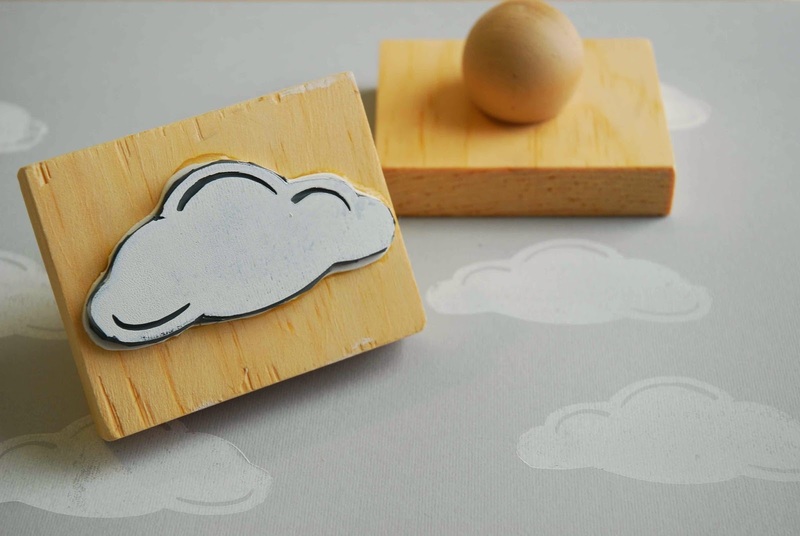 For this stamp making craft, you'll be looking for flexible (unmounted) lino sheets, that are easy to carve and easy to cut. If you're in Ontario, you can find these sheets in the printmaking section of art stores like Curry's and Deserres. I've photographed a few different examples that I've been working with; all of them work well for stamp making. 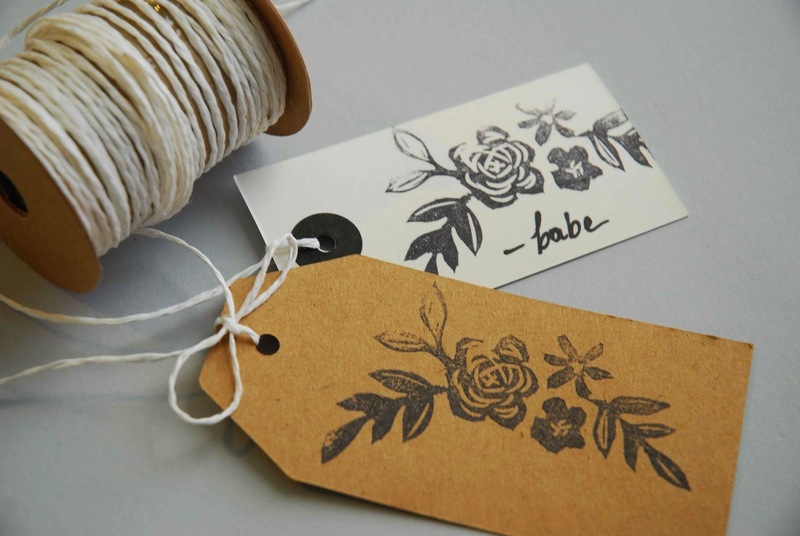 Start by designing your stamp. 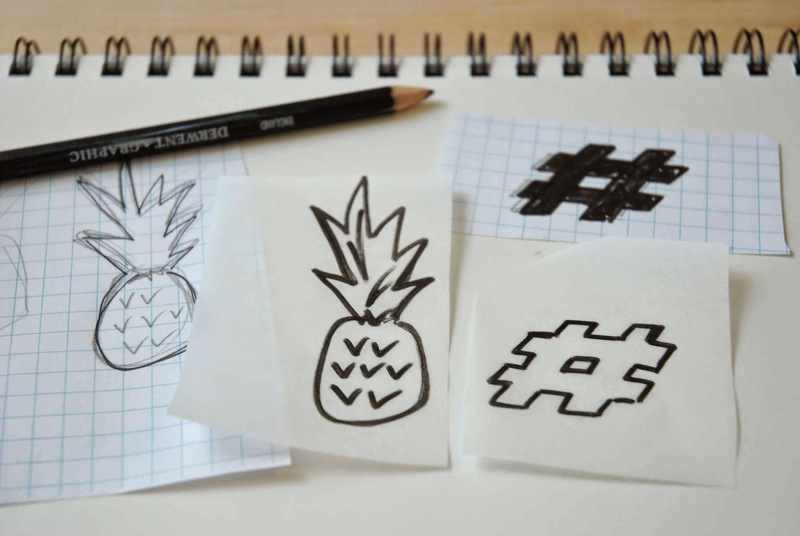 I've drawn a small pineapple and a hashtag, both of which are fairly simple designs. 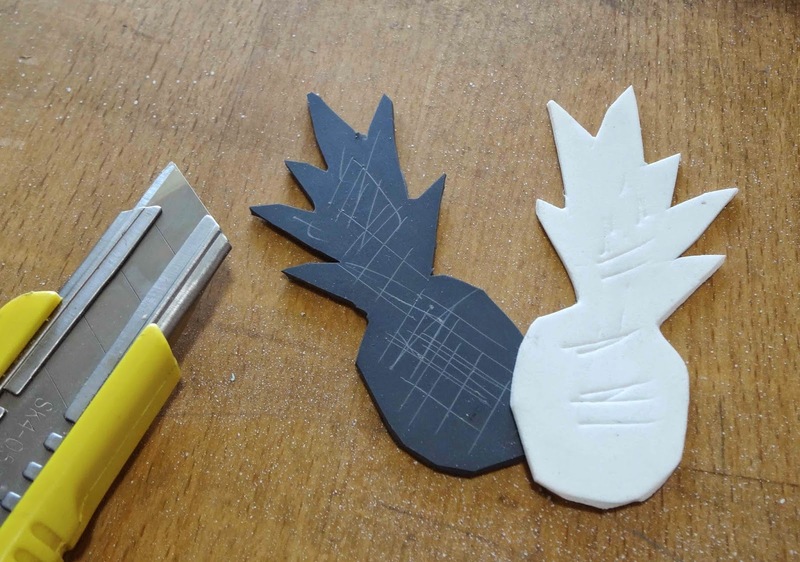 This is a carving project, so if you haven't done any carving (print making) before, you'll want to begin with a straight forward shape. 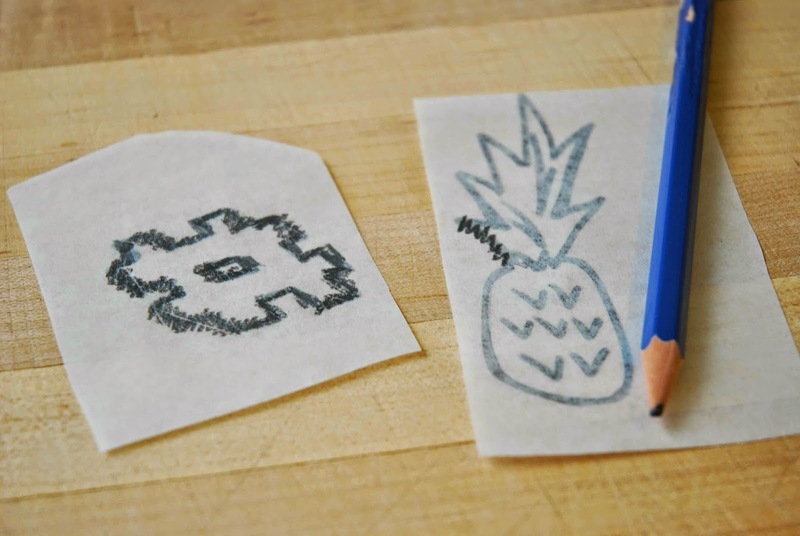 Once you have your drawing just right, copy it onto a piece of tracing paper using a marker. Flip the tracing paper design over and cover the back of your drawing with graphite (just scribble over it with a pencil). 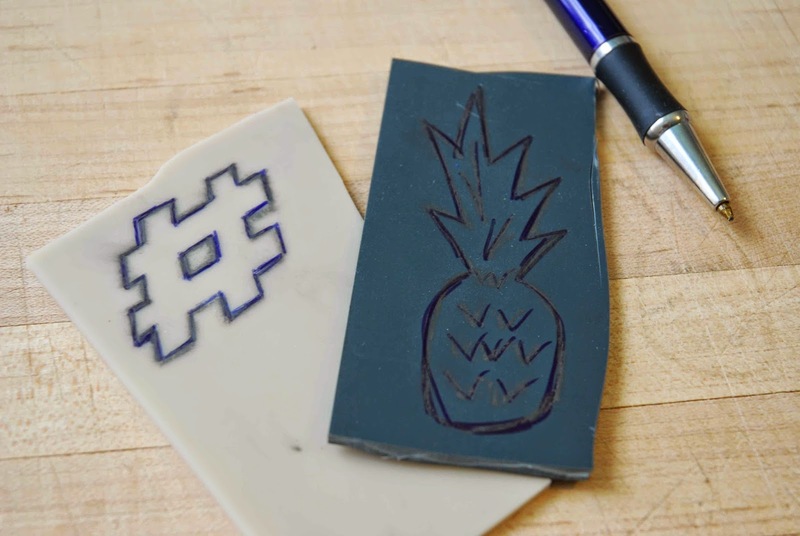 You'll use this graphite to transfer your design to the lino sheet for carving. If you're thinking: but, Shayda, I could just use carbon transfer paper! I would say, I tried that and it didn't work. But I don't know why! I guess transfer paper doesn't work well on lino. Flip your design back over, and place it right side up (scribbley side down) on the lino sheet. 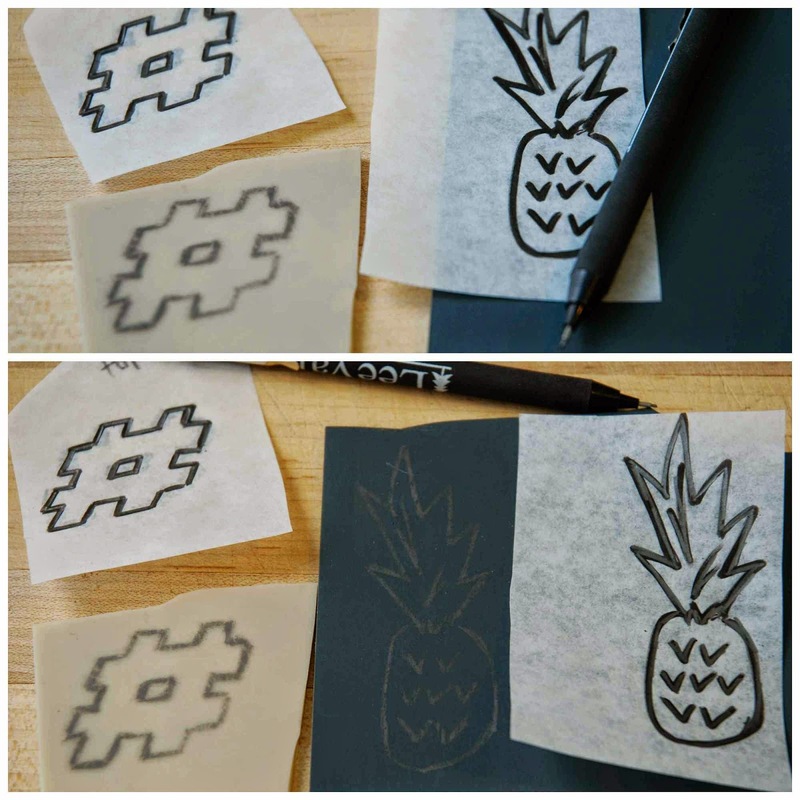 Trace the lines of your image with a pencil in order to transfer the design. The transfer is usually faint and very easily smudged. It helps to go over it with a ball point pen before you begin carving. 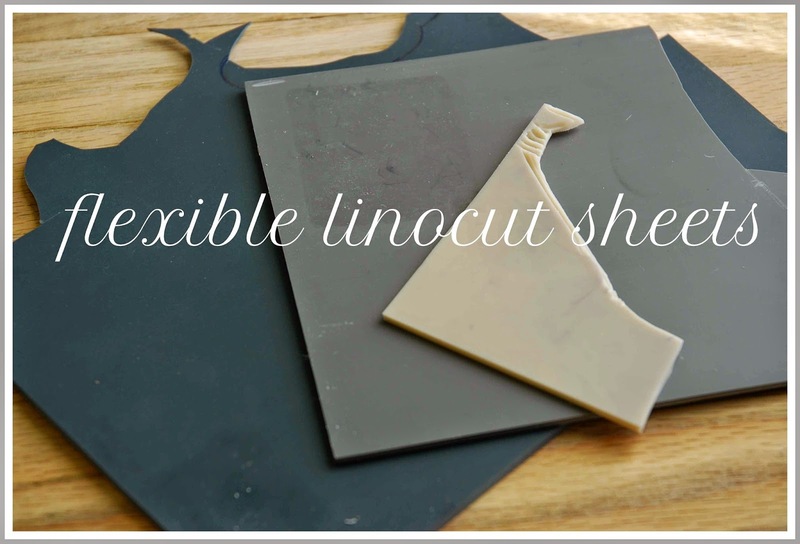 Time to carve your lino! The Speedball carving tool (lino cutter) is comprised of a handle and multiple cutting attachments. The blades are stored in the handle and are numbered from 1 (the smallest, for cutting very thin shallow lines) to 5 (the largest, for wide cuts and removing bigger areas). To insert or remove a blade, twist the silver upper part of the handle. The cutting attachments fit snugly around the ball in the centre. How you carve is up to you! It takes some practice, but it's not difficult and it quickly becomes very addictive and enjoyable. 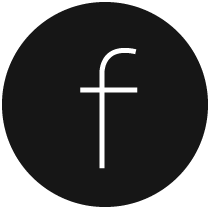 I like to start by removing the outline of my design, followed by the negative space, but some people say the opposite is best. It's up to you! It's also helpful to have an exacto knife nearby to help with tricky cuts. 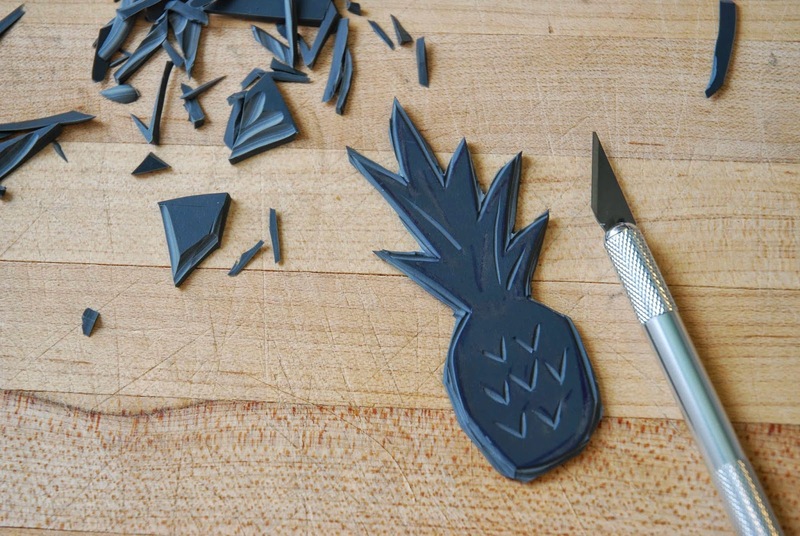 When you are done carving, cut your stamp out of the lino using an exacto knife. 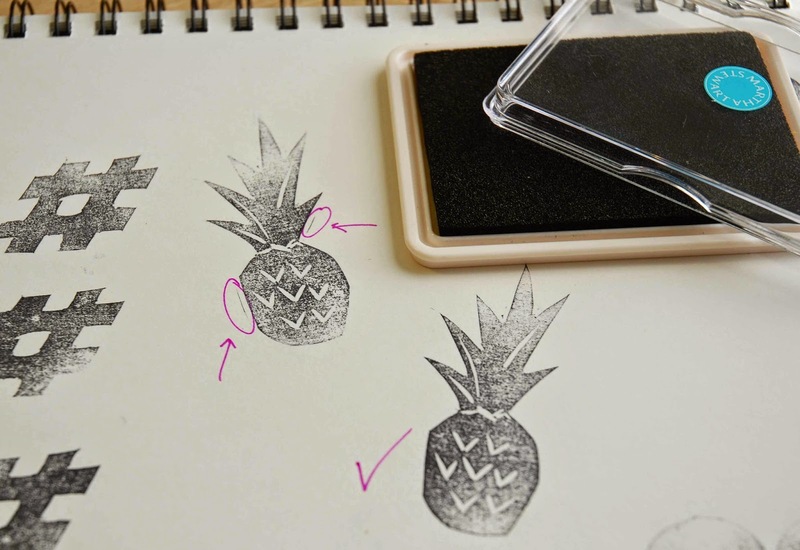 To complete the stamp carving process, test your stamp. I ink my stamp and try printing it in order to check for funny looking areas or spots that I need to work on some more. This part of the project is really all about the supplies. Gather some wood blocks. I went to Home Depot and bought a piece of 4x1" 'hobby wood' (it wasn't as rough as construction wood), in a 2 ft length. Then I had them cut it at every 3 inches. (Which they did for free). 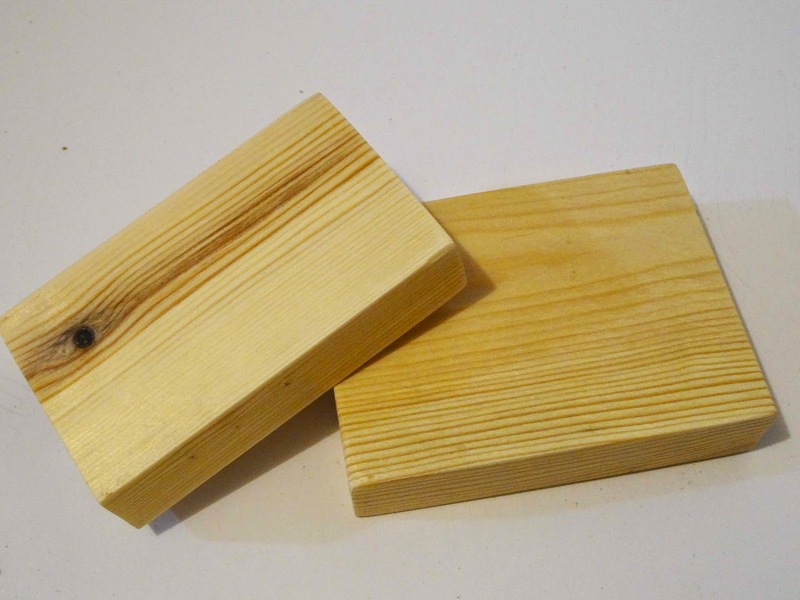 So I went home with a pile of 3x4x1" rectangles. I also found myself some 'handles'. I bought twenty wooden knobs that I found in a discount bin. 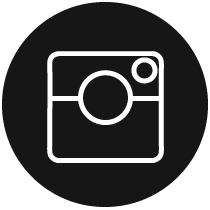 Once you've purchased your knobs and wood blocks, you'll need to find the corresponding screw and drill bit in order to attach them. Ask for advice at your local hardware store if you need any help with this. It's a good idea to have the knob and wood block with you when you go shopping for the screws. (To attach my knobs to the blocks I used number 12 1 1/2" screws and to create the hole for the screw I used a 3/16 drill bit). Take your wooden block and find it's centre using a pencil and ruler. (Just draw and 'X' from corner to corner). Before drilling the hole, I like to use a centre punch. The indent it makes helps to guide the drill (which is nice for a power tool novice like me!). Next, drill a hole for the screw to fit through. Once the hole is drilled, I like to give the entire block a really good sanding with 60 or 80 grit sandpaper. In order for the stamp carving to lie flat, you'll need to sink the screw so that the screw head sits flush with the wood. 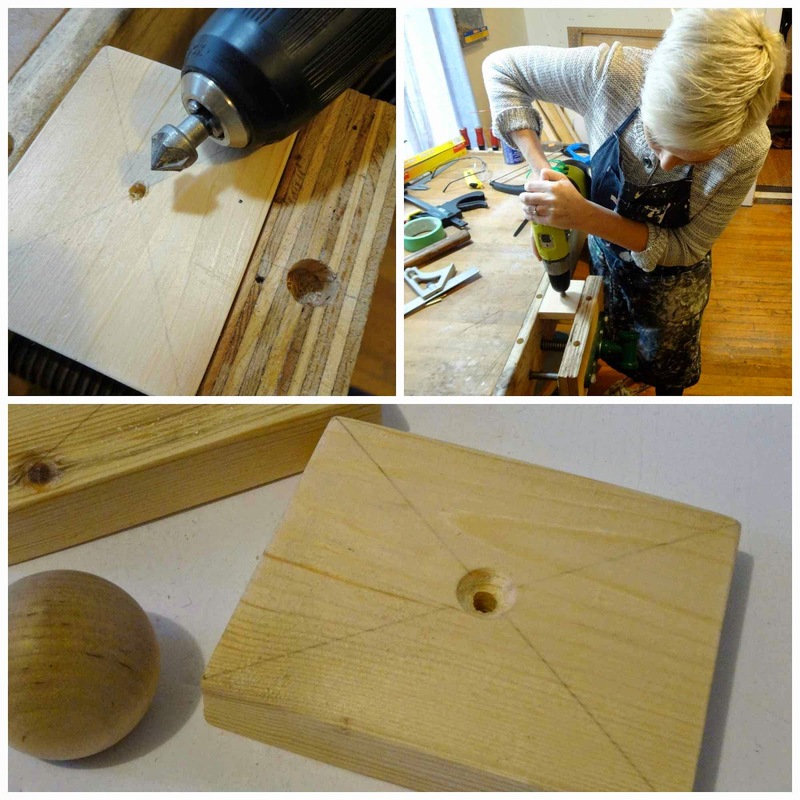 Switch to a countersink drill bit and drill in the same spot. Time to assemble the handle! 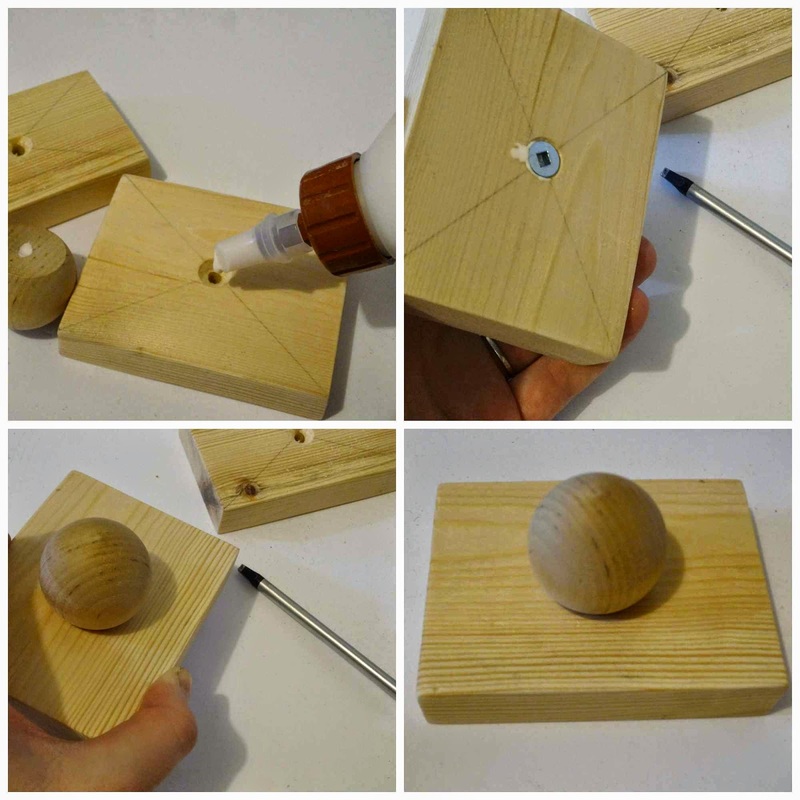 Put a small drop of wood glue in the screw hole and inside the wooden knob. 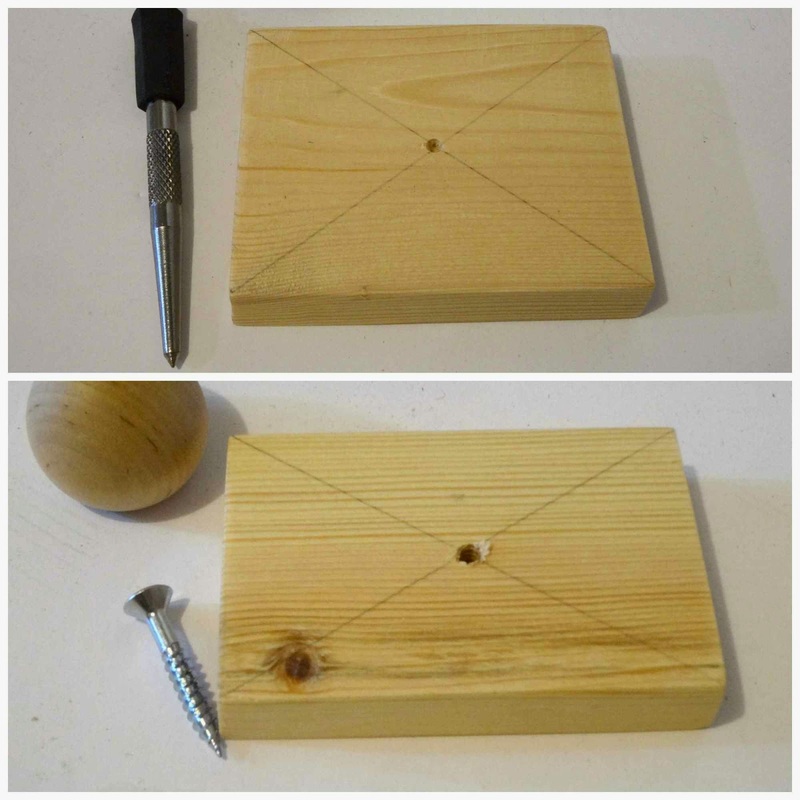 Screw the knob and wooden block together using your screw and screwdriver. Finish with a coat of clear polyurethane if you like. 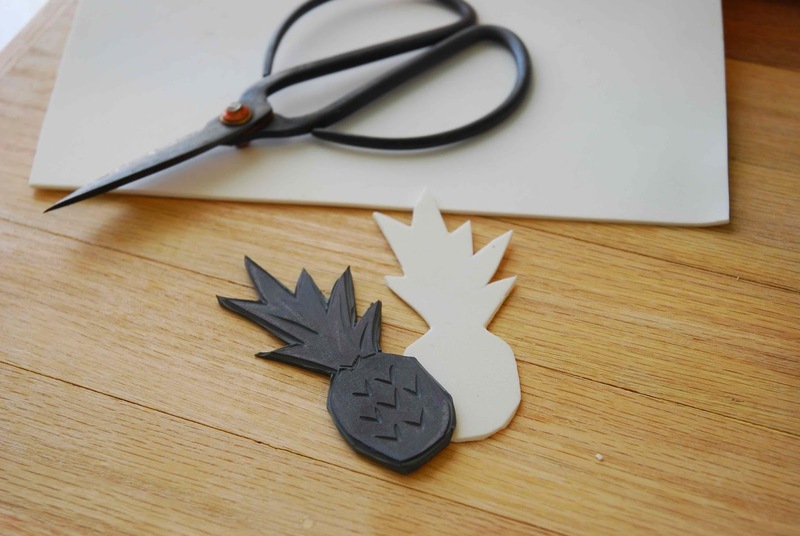 Trace your stamp on to a piece of craft foam and cut it out. (The foam gives the stamp a little extra height, which helps to guard against block smudges when you're inking the stamp). Roughen all surfaces (the back of the stamp and both sides of the foam) in preparation for assembly. The ridges in the material will guard against delamination and will help the epoxy form a strong, permanent bond. Using a five minute two part epoxy, glue the foam on to the back of the stamp. Then glue the stamp (with foam backing) on to the wooden block. 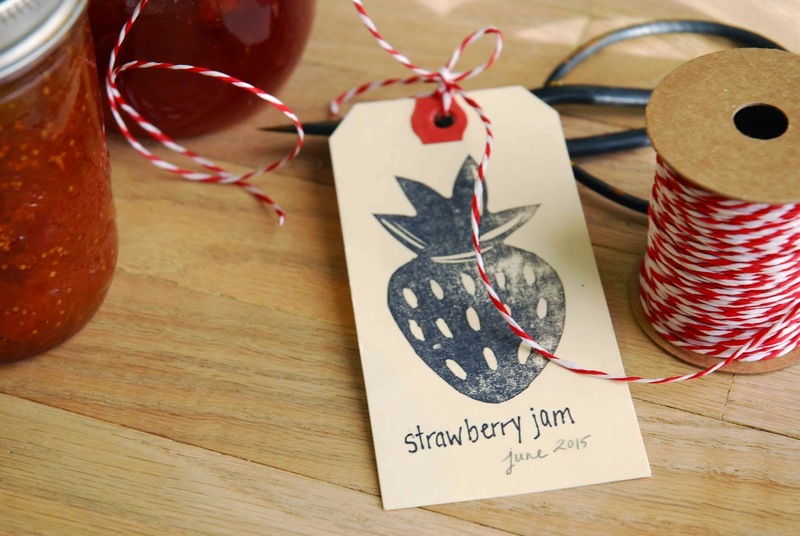 Use a jar to keep your stamp face-up while the epoxy cures. To use the epoxy, simply follow the directions that come with it. You can find two-part epoxies at hardware stores or even some dollar stores. When using the epoxy, it's a good idea to wear latex gloves. If any epoxy gets onto to the stamp face, use rubbing alcohol to wipe it away as soon as possible. (Same drill if it gets on your skin). 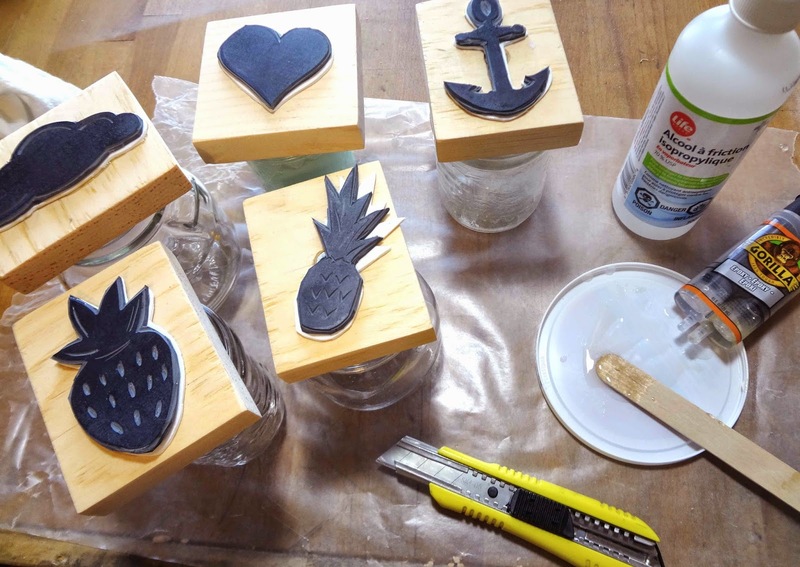 Once the epoxy has cured your stamp is D-O-N-E! Time to get the ink and get creative! Now the fun part! Printing! 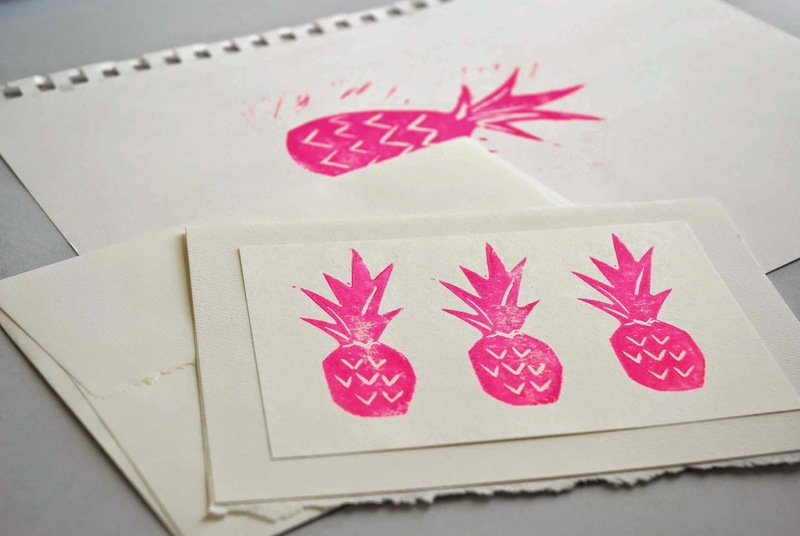 You can ink your stamps with any regular ink pad, but you can also use blockprinting ink (it's more like paint) to get some really vibrant colours (and it's a lot cheaper than buying a whole rainbow of stamp pads)! In order to use your printing ink, you need to create an 'inking plate'. 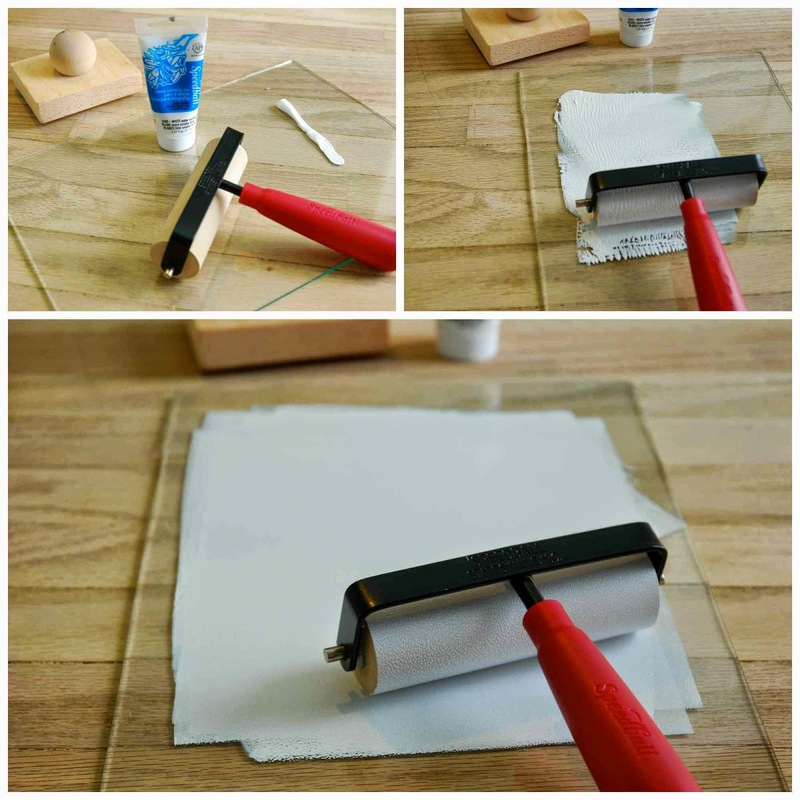 Your inking plate can be a piece of glass, or alternatively, you can tape a piece of wax paper to the table. 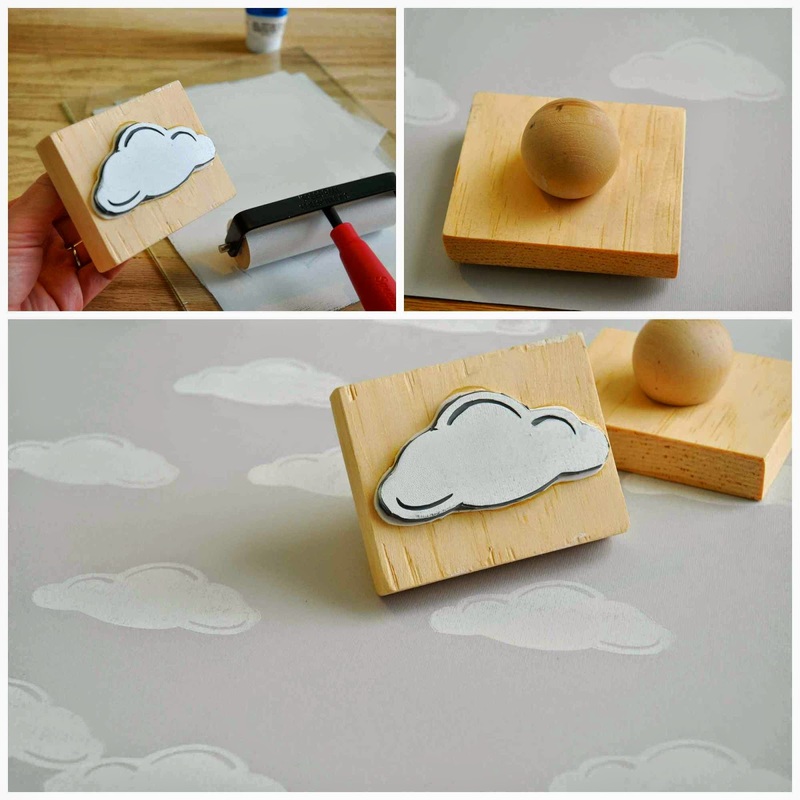 Squeeze a line of printing ink on to the plate and use a soft rubber brayer (roller) to spread it evenly across the surface. When the peaks of the ink are small and the roller is sticking to the plate just slightly, you are ready to ink your stamp. 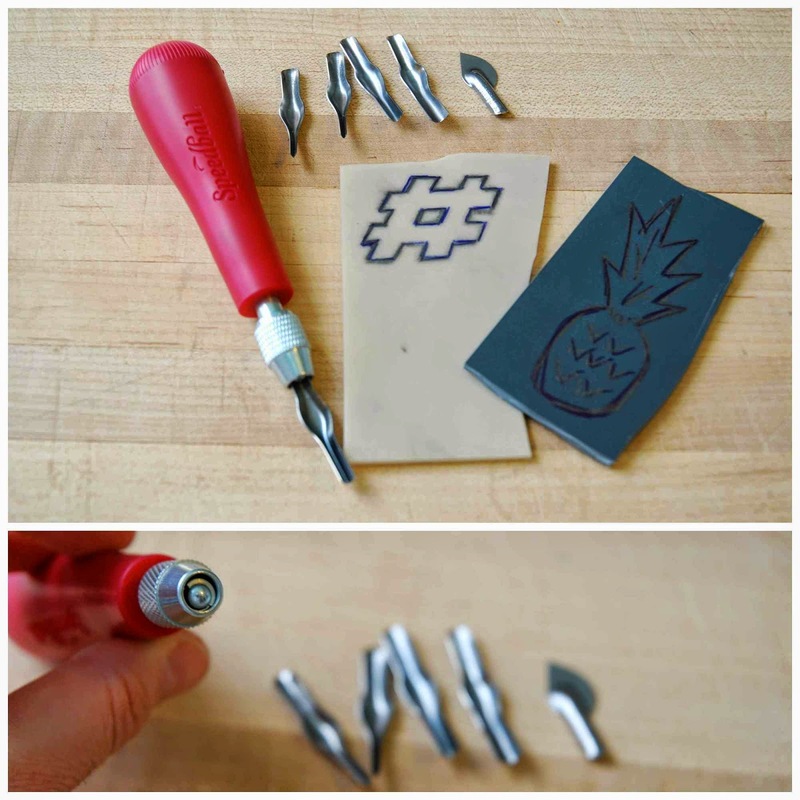 Run your rubber brayer across the stamp to ink it. I found that it did not work to put the stamp face-down in the ink. 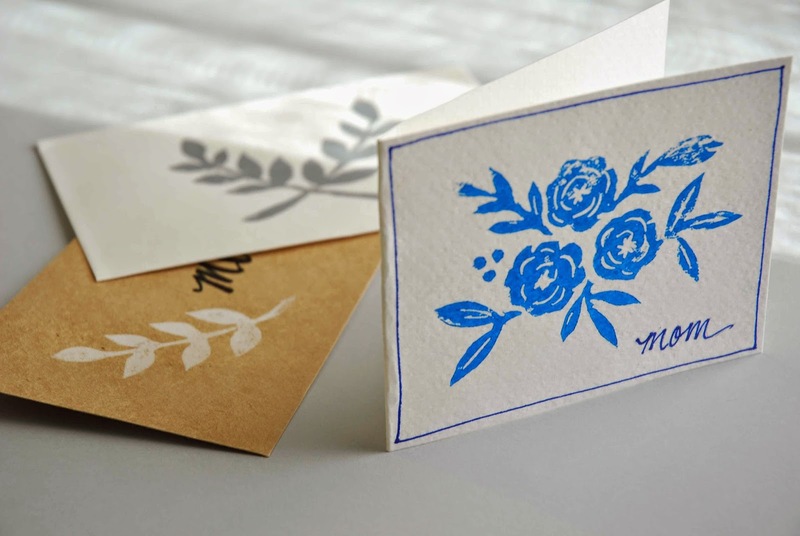 Once the stamp face is coated with ink, press the stamp firmly into a piece of smooth paper and lift off carefully. The first few prints may not be perfect- I found it took a bit of practice- but soon enough you'll have beautiful prints! There are endless uses for these hand carved stamps! 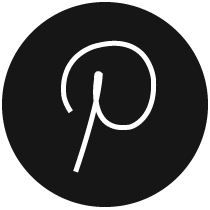 You can make personalized stationary, invitations, menus, labels and so much more! I'm currently planning new blog posts on different ways to use these stamps. This post was already so long, and I didn't want to go overboard with information! But be sure to watch the 11th apartment in the next few weeks for more 'stamp crafts'! 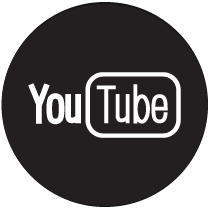 If you have any questions about this process, please leave a comment below. 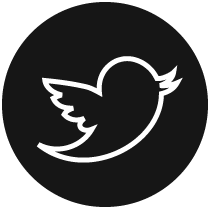 I will answer right away, and if it's a large enough question, I'll right a follow-up blog post.